Great Cocktail Recipes: Looking to make Horchata or Rumchata without all the headaches? Looking to make Horchata or Rumchata without all the headaches? For the people that love horchata, you know it's a grueling process. A lot of different ingredients, a lot of shaking. But the product turns out great, right? 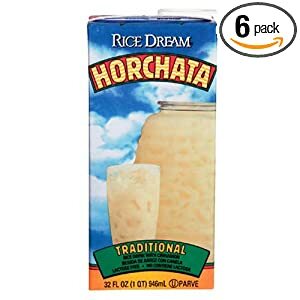 Well, this horchata is actually pretty solid and it comes in a pack of 6 for $14.99. With all the ingredients that come with horchata, you'll be spending at least 15 to 20 bucks to make it (if you don't already have the ingredients on standby). I you don't believe me, you might wanna take a look at my horchata post. Imagine Rice Dream is actually a quality and recommended product that makes the Horchata process a lot easier. The great thing about Rice Dream is that it's gluten and lactose free...perfect for you people that are a bit sensitive with your stomach or have a condition where gluten foods are not suitable for you! Try it out! Guaranteed, you'll love some good ol Rice Dream Horchata!